Please select your Media and size preference from the menus below. Clicking Buy Now will take you directly to the checkout screen. PDF and CAD files will be delivered electronically. Please provide a valid email address. Vine, 11'x18' Vine A, 10'-8"x18'-8"
THE Vine is our smallest garage. So small in fact, that in some places no permit is required to build it. (Please do indeed check if you need a permit for it in your jurisdiction before you build. We don't want to unwittingly lie to you). If you have good observation skills, you may notice that our nomenclature should declare this as a zero car garage. You are a smart one. But you know how rules go: 'i' before 'e' except after 'c', EXCEPT in words like neighbor and weigh. Or, 30 days has September, April June and November. All the rest have 31 EXCEPT February which has 28 EXCEPT in a leap year which is every four years EXCEPT if... Yes, the exceptions keep going. Since you may not need a permit to build The Vine, you also do not need to build a portal frame. You should thank us for that. 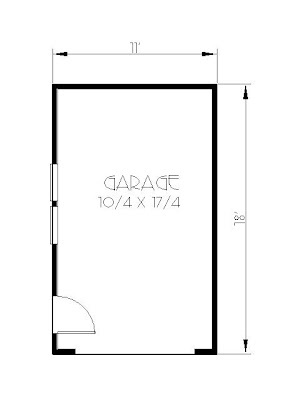 This is a perfect garage for a lot that has alleyway access or a narrow little driveway. You could throw this up in a weekend and still have time to change your oil in the comfort of it. You could actually park the car in the garage if you stick framed the roof or used attic trusses for storage. Since some building jurisdictions require a full 18'-0" clear in depth for legal vehicle parking, you may want to consider the Vine A option. 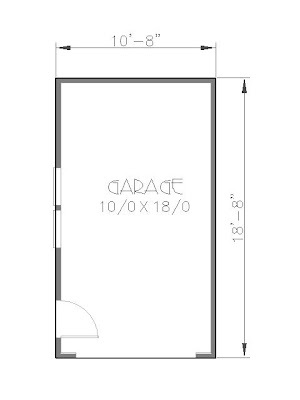 While the exterior dimensions may not be perfectly tuned to building material economy, it definitely complies with the 10'x18' parking area. Even though a building permit may not be required, the zoning permit could be the hangup that requires the 'A'. In the event that height is an issue, you are welcome to change the roof pitch as needed. You don't need us to figure that out for you! 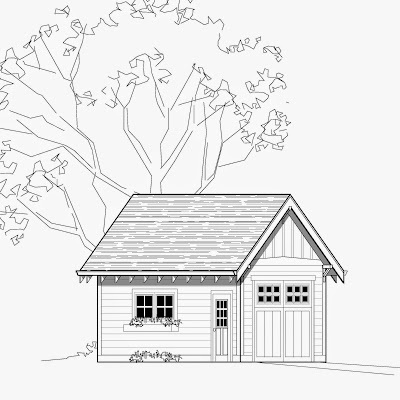 This plan is sold with a slab style foundation included. If you need to modify to a suspended garage, please contact an engineer local to your area.